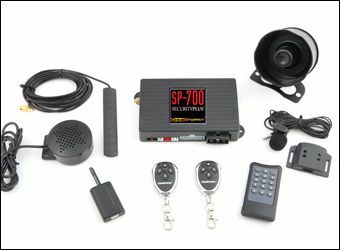 The SecurityPlus SP-700 is a 1-Way alarm system with a built-in GSM system to allow the user to control the system using any mobile phone. It comes with (2) transmitters for use as a regular alarm/keyless entry system or you can dial into the system using your cell phone to control the system and check the system status. The system houses a SIM card internally so that the user can dial into the system to get the status as well as send commands. The system will also report any violations and status changes via text message or phone call. The also includes an external speaker and microphone so that the user can dial the vehicle ans speak to the driver. The system is completely hands free so all the driver has to do is answer the incoming call using the included dialer remote and the system will read out the phone number of the incoming call over the speaker. The system also has a "Listen In" function which allows the user to dial the system and activate the microphone only so they can listen in on what going on inside the vehicle. This is especially user in case the vehicle is stolen and you want to know what the driver is doing. The SP-700 has a wide variety of functions that can be done via text message or by phone call using the systems automated menu. The user can check the status of the vehicle, lock or unlock the doors, activate the built in immobilizer (for theft recovery), or remote start the vehicle if the vehicle also has a remote start system on the vehicle. Once the user dials into the automated system, it will prompt the user to choose what they want to do by pressing a number on the keypad of there phone. They can also do the same commands through text message to the vehicle for faster use. The system can also be password protected so that only the vehicle owner can access the system or send any text messages.